The penthouse is located on a quiet central location in Leukerbad. From the sunny balcony you have a wonderful view of the Valais mountains and the village. The comfortable equipment offers optimal living quality and is a wellness oasis. 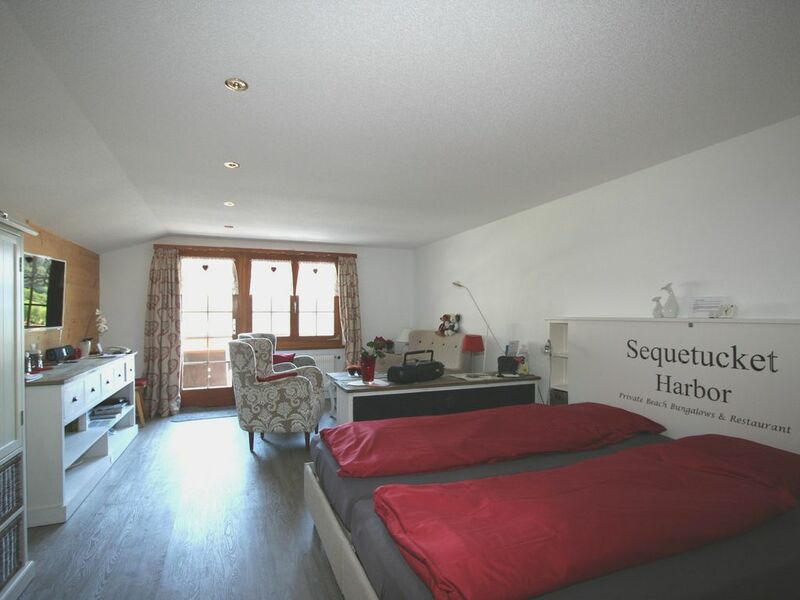 The apartment offers maximum living comfort for 2 people on 42 square meters (1 1/2 rooms) (without children's room in the pitched roof) and is awarded the official **** star classification of Switzerland Tourism. If you are more than 2 people, you can rent an additional room (children's room in attic) with 2 beds. I am happy to send you a detailed offer if you are interested. With the children's room in attic, there are a total of 54 square meters (2 1/2 rooms) available. The apartment is one unit. The living room is furnished in a trendy alpine style. The sleeping area has a double bed with single top mattress. In the bed slats the head and foot parts are individually adjustable. The bathroom and kitchen have been remodeled and fitted with quality new materials and appliances. The fully equipped kitchen has a dishwasher, ceramic hob, design steam extractor, oven with microwave, Nespresso coffee machine, coffee filter machine and much more. Of course, HD flat-screen TV with cable connection about 130 programs, DVD player / Blu-ray, free Wi-Fi / LAN, stereo, BOSE-SOUNDLINK Bluetooth speakers, comfortable beds, etc. available. The apartment leaves nothing to be desired. Baby cot, children's highchair, 2 Kindererhöhungsitzkissen, baby bath, baby wash bowl, changing mat, children's and children's cutlery, games, toys, 2 Davoser wooden sled, etc. For questions you can contact me. The apartment is suitable for the active (skiing, ice skating, cross-country skiing, hiking, climbing, biking) as well as for the peace seeker (thermal bath, spa, medical application). Families with 2 children are most welcome. The apartment includes a free parking space at the house. The Internet Wi-Fi or LAN and the phone calls to Swiss mobile and Swiss fixed network is also free. The apartment is a Non smoking apartment, but you are welcome to smoke on the south balcony. All guests receive from me the Leukerbad Card Plus (guest card). With this card, you get many free entries year round (sports arena, tennis, table tennis, Badmington, indoor football, squash, boulder wall, e-bike test, alpine taxi, local bus, bus lines to Inden, Albinen and bottles, free skiing on the Erli lift the sports arena) and discounts (thermal baths, cable cars, ski passes, various events). Sehr schön eingerichtete, moderne Wohnung. Alles vorhanden was man benötigt. Zentrale Lage als idealer Ausgangspunkt für Wanderungen, Biketouren, baden ect. Die Vermieterin ist sehr hilfsbereit und auf Anfragen erhält man umgehend eine Antwort. Die Wohnung hat eine sehr gute, ruhige Lage und ist mit viel Geschmack eingerichtet. Die Ausstattung ist sehr gut, alles ist perfekt organisiert. Die Vermieterin ist sehr nett und hilfsbereit und konnte uns viele Tips geben. Wanderkarten und Infomaterial ist reichlich vorhanden. Wir waren Mitte Juni dort und hatten herrliches Bergwetter. Im Tal ist es noch einige Grad wärmer und es gibt dort schöne Weinwanderwege. Wir haben uns sehr wohl gefühlt, und werden immer wieder gerne in dieser Wohnung und herrlichen Landschaft unseren Urlaub verbringen . Zuvorkommende Gastgeberin. Komplett mit jeglichem Komfort ausgestattete Wohnung an zentraler und dennoch ruhiger Lage. Idealer Ausgangspunkt für Wintersport, Wander, Biken oder Wellness in den nahegelegenen Thermalbädern. Alles Bestens! Super Kontakt zum Vermieter! Werde wieder kommen. Alles hat bestens geklappt. Wir trafen eine super schön eingerichtete Wohnung an. Alles sauber und mit Liebe eingerichtet. Nichts fehlt! Schöne Sicht vom sonnigen Balkon über das Dorf. Wir fühlten uns wie zuhause und können auf einer Skala von 1 bis 10 sehr gut eine 10 vergeben. Die Vermieterin ist sehr nett und kann jederzeit kontaktiert werden für Fragen oder Tipps! Wir empfehlen die Wohnung gerne weiter. Leukerbad is the largest spa and wellness resort in the Alps. Both in winter and in summer there is the active athletes (hiking, biking, climbing, swimming, skiing, ice skating, winter hiking, cross country skiing, etc.) and the holiday maker (thermal bath, massage, spa, etc.) the right offer. In 3 to 4 minutes walk you are already on the trails or in the Gemmibahn. On the Gemmi is a large, popular hiking area. Ski: The beginners and children's ski area 'Erli' is located in close proximity (3 minutes walk) from the house. The alpine ski resort 'Torrent' can be easily reached by local bus (stop 1 minute walk from the house). The cross-country skiing and winter hiking paradise 'Gemmi' can be reached by cable car (valley station 4 minutes from the house).